Earlier this spring I had the great pleasure to attend a Phoenix Landing lecture, with guest speaker Nyla Copp, “Get The Flock Out!” in which she discussed the importance for the health of our parrots to provide them with time outdoors in the sunshine & fresh air. Exposure to UV light is vital to parrots in order for them to produce vitamin D, which is essential for the utilization of calcium, a necessity for parrot health. There is no better source for UV light than pure, unfiltered sunshine. Parrots have a highly refined respiratory system which makes them more susceptible to chemicals and contaminants in the air. With indoor air quality decreasing over the years, avian vets have been seeing an increase in the number of companion parrots with respiratory illnesses. This was true of the little lovebird, Orlando, who came to live with Nyla several years ago. Nyla combined her construction skills, creativity, and passion for providing the best care possible for her new companion and built Orlando an outdoor aviary. 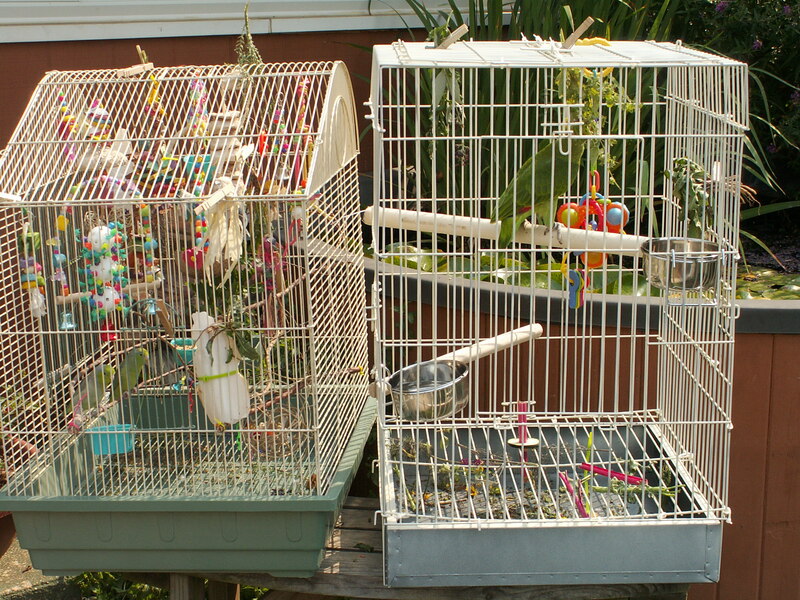 Through her business, My Birdie Buddy, Nyla now designs and builds custom aviaries, as well as unique perches and playstands. In her presentation she shared invaluable tips and advice on design, materials and construction techniques for building aviaries, from simple to elaborate, from enclosing a porch or deck to building large free-standing structures or small portable ones, and left the entire audience longing for their own aviaries for their birds. I have yet to build an aviary, for my requirements for one are high, as it must be able to contain my very powerful GreenWing Macaw, Annie, and be big enough to allow each bird to have enough personal space to prevent fighting and allow flight. In truth, I think I will need at least two separate enclosures; but this does not mean that my birds are sitting indoors waiting for me while I plan and dream and research aviaries? NO! We go outside as often as we can, nearly every day. From my very first days with parrots, I have always taken them outside. At first, my little parrotlets were in a cage that I could pick up and carry so I would bring them out and set them on a table or bench or chair whenever I was out working in the yard. Then when Ariel joined the family, her cage was too large for me to carry around, and a friend gave me an older, travel sized cage which we used. But even that was very awkward, as it became more challenging to find places to safely set her outdoor cage. Then one day I was attending a Phoenix Landing event, and I saw John Kerns, rolling a travel cage mounted to a babystroller frame. Wow, what a great idea! John told me that his wife Bobbie put them together and calls them “cageollers” and most generously offered this one to me! I will be forever grateful! Thank you, thank you John & Bobbie! Once home I mounted Ariel’s outside cage onto the stroller frame and secured it firmly with zip ties (the cage that John gave me had bar spacing to large for Ariel’s little head). Now she traveled with me all around the yard wherever I went, she could reach through the bars and nibble on parrot safe plants, could easily be moved in or out of the sun or shade, with ease and safety. From the day I knew that we would be getting Trixie, I began looking for a second stroller base to build a cageoller for her. I had no luck finding another like Ariel’s, and upon meeting Trixie, a BIG Blue & Gold Macaw, realized I needed something bigger anyway. We had a large wire dog crate in our attic that would work as a cage section, and I just needed to find a base. While glancing through one of my husband’s tool catalogs, Harbor Freight Tools, I noticed an ad for a flat (no sides) powder coated steel garden wagon. I checked the measurement of the wire crate, 36” long x 23”wide x 24”high, and realized it would fit nearly perfectly on the 24”x48” wagon, all the better that it was on sale! I removed the bottom plastic tray from the wire crate, and again used zip ties to attach the two together, trimming off the excess of the tie. I initially replaced the plastic tray, but realized that without the tray, poop, and water from misting, and pieces of food could fall straight through into the grass, resulting in less required clean-up. 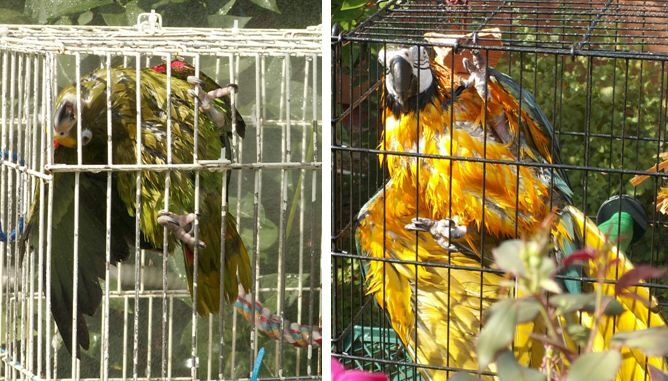 One of the major downfalls of using this type of cage for cageollers though, is that since my birds really love being misted (and I mean soaked down to the skin wet!) nearly every time we go outside, the cages were rusting and powder coating peeling off very quickly. That’s when I came across the King’s aluminum travel carriers (contact Phoenix Landing for purchasing questions). They all have 5/8” bar spacing, this would work for all but the smallest birds. The larger one is 20x29x20, the smaller one is 18 1/2×16 1/2x 18. Aluminum is very light weight, will not chip, flake or rust like powder coating. I will admit they are pricey, but I look at it as a long-term investment. The Kings are too small for Trixie and Annie macaws who still use the wire dog crates, but they work great for my other birds, so everyone has a cageoller to fit their needs. Cageollers are great for traveling with your birds too. Once removed from the cage/carrier, the stroller folds flat, and when you reach your destination, reattach the cage to the stroller using several bungee cords, or you could use zipties, just remember to bring scissors to cut them off when you are ready to take the cageoller apart for the trip back home. 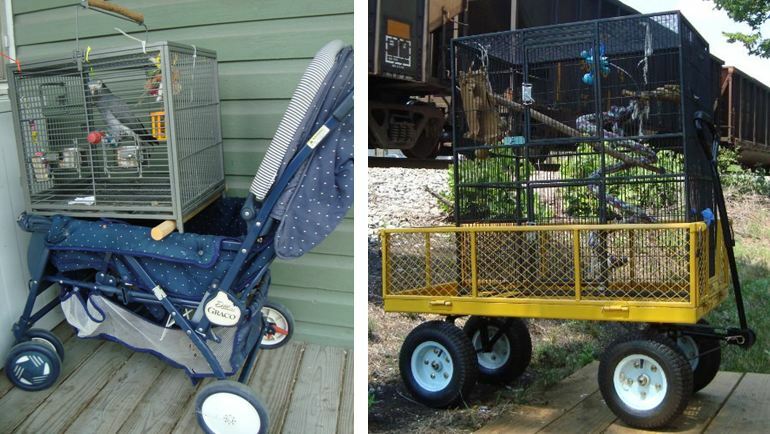 So go find a cage or carrier appropriate for your bird, pick up a stroller or wagon, build your own cageoller, and get outside this summer!